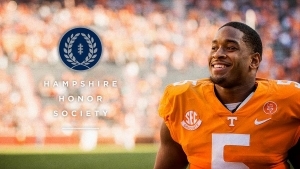 IRVING, Texas – Tennessee football’s Kyle Phillips was announced as a member of the 2019 National Football Foundation Hampshire Honor Society, Wednesday. Phillips joins 11 other VFLs who have received the honor since its inception in 2007. Qualifications to join the NFF Hampshire Honor Society include achieving a 3.2 cumulative grade point average throughout entire course of undergraduate study, being a starter or significant contributor during the 2018 season and meeting all NCAA-mandated progress towards degree requirements. Phillips finished third on the Vols with 56 tackles and second in sacks (5.0) and TFLs (8.0) in 2018, while leading UT with five hurries and adding a pick-six, four pass breakups, one forced fumble, one fumble recovery and one blocked kick. He was a three-time SEC Academic Honor Roll recipient while also being named a semifinalist for the 2018 Jason Witten Collegiate Man of the Year Award and the 2018 Campbell Trophy. The Sport Management Major finished with a 3.48 GPA while being a nominee for 2018 AFCA Good Works Team and also collected Google Cloud Academic All-District honors in 2018.